Charles Spurgeon called Andrew Fuller the greatest theologian of his day. Fuller pastored in Kettering and considered himself a “strict Calvinist.” However, his associations with Ryland, Sutcliff, Carey, Pearce and Hall, led them all (all being strict Calvinists) to propose that the gospel must be taken to the heathen. Fuller wrote this treatise in 1785, attempting to show that one may be a Calvinist and still believe the gospel may be preached with evangelistic zeal. 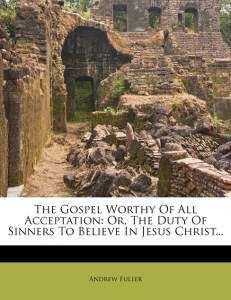 Fuller believed it was the duty of every man who hears the gospel to receive it, and also that every man is bound to believe whatever God has revealed. These things seemed revolutionary in Fuller’s day and caused revival in churches and missionary work. While Carey gave his life to India, his good friend Andrew Fuller gave his life to holding the ropes by serving all of his life as secretary of the Baptist Missionary Society and raising funds to support Carey.